"Why would anyone go underwater into an uncomfortably tight squeeze, just to get into another rock chamber that goes nowhere?" That's the question Joseph Emmanual poses early on in his remarkable new book "Into The Deepest And Darkest." This is, says the author, the nature of the cave diver, to go somewhere just to see what is around the next corner. It's this drive to explore, he suggests, that far outweighs the crave for the adrenaline rush that comes with going deeper and farther than anyone before. Emmanuel should know, as he was a support and safety diver in four world record deep dives, and "Into The Deepest And Darkest" represents a record of his experiences and recollections of those incredible accomplishments. Emmanuel, a software developer and business analyst with a degree in economics, is a tech diver and scuba instructor who grew up in South Africa and became part of the teams exploring the mines, caves and sinkholes of the region, and culminating in deep diving records for both males and females at Boesmansgat, an innocuous looking small and shallow pool of water at an altitude of about 5,500 feet. Yet, beneath that rocky pond lies one of the most massive underground bodies of water, reaching down to a depth of 940 feet. This is where cave diving legend Sheck Exley reached 863 feet in 1993, a year before he perished at an attempt for an even greater depth at Zacaton on the Yucatan. Having watched the exploits of Jacques Cousteau as a youth, Emmanuel began his diving career in 1991 in the club structures of SAUU, the South African Underwater Union, an affiliate of the World Underwater Federation (CMAS). There he met Nuno Gomes who was a local chairman and driving force behind the group's cave diving efforts, and also Verna Van Schaik, both of whom would go on to set world deep diving records. The author became an accomplished diver, honing his skills in such places as Badgat (a flooded former asbestos mine now known as Komatie Springs), the Vetsgat cave system, the Wondergat sinkhole complex, Bobbejaansgat, and other localities within driving distance of Johannesburg. The author relates numerous experiences, anecdotes and pearls of wisdom on things to be observed and things that can go bad in deep, dark places. Emmanuel is a big believer in a practical, methodical approach with a lot of common sense and backups for anything that can go wrong. "It's folly to trust one's life to a device designed by fallible people and, more importantly, powered by batteries," he says, stressing playing by the rules without ever being preachy or condescending. Emmanuel's style and storytelling reveals the perfect team player, secure in his considerable skills, always acknowledging the qualities and accomplishments of other divers, never dissing anyone, without, however, whitewashing conflict or diverging opinions. The book covers, in some detail, deep diving expeditions by Nuno Gomes at Boesmansgat in 1993 and 1994, and a world-record dive to 927 feet in 1996. We learn about a lot of the background and mechanics of such ventures, from the challenge of attracting sponsors, to the logistics that can be the line between life and death, and all the unanticipated problems that can and will occur. Apparently able to mesh with many different personalities, Emmanuel also becomes a member of Verna Van Schaik's team, training new members, participating in "build-up" dives at Badgat, and a record attempt in 2001 at Boesmansgat. Van Schaik reached 610 feet, just to see that record surpassed by Claudia Serpieri while the team was still on location. 2002 and 2003 saw additional Gomes expeditions to Boesmansgat, each with unique experiences and challenges, such as being struck by lightning while at 20 feet, and then a planned record attempt by Van Schaik in 2004. Emmanuel describes a scary experience where, ascending from a 360 foot dive in the mines of Badgat in support of Van Schaik, he found himself with DCI symptoms with visual disturbances and severe memory impairment. Decompression chamber treatments eliminate the symptoms, leaving Emmanuel uncertain whether he'd experienced DCI or just a migraine. He decides to also surgically repair a PFO (Patent Foramen Ovale), an opening between the left and right heart atriums that closes in two out of three people within weeks of birth but may present diving risks if it is not closed. Within days of the surgery, there are additional problems, requiring blood thinning meds and a six month hiatus from diving. Just a month later, Van Schaik has a close call at Badgat when her fin gets stuck in a shaft at 500 feet or so, and Emmanuel, still unable to dive, is not invited to go along with Gomes' team for a record attempt in the Red Sea. By the end of 2004 he is declared fit to dive again, and heading for another Van Schaik record attempt at Boesmansgat. This time, the deep support is provided by Don Shirley and Dave Shaw, both on rebreathers, and Van Schaik reaches an incredible 725 feet. Three days later, Shaw would reach the bottom at 885 feet, finding the body of another diver, Deon Dreyer, who had perished a decade before. Though not part of the eventually fatal attempt by Shaw to recover the body in January of 2005, Emmanuel includes a report and measured commentary. In 2005 it's time for another Gomes record attempt, this time for the absolute deep diving record in the Red Sea. Emmanuel describes the build-up dives, then the experiences and tribulations in Egypt on a 350 mile drive with lots of gear from Cairo to Dahab. This part of the book is by far the most detailed, and describes the succession of events that eventually led to Nuno Gomes' 1044 feet world record dive that, after taking into consideration stretching of the shot line in the water, was later corrected to 1056 feet. This record, though, was also quickly surpassed by a claimed 1082 feet dive by Pascal Bernabe, though that record was not recognized by the all-important Guiness Book of World Records (which apparently has stopped listing records it seems too dangerous to pursue). Emmanuel closes with a section on equipment considerations, describing his preferred gear, highlighting pros and cons, and how he made his choices. Like many literary efforts covering extreme sports that fuel the imagination of a few but do not benefit from extensive TV coverage or massive financial rewards, "Into The Deepest And Darkest" is essentially a self-published labor of love. As such it's available for just ten US bucks in various electronic formats (I reviewed the book in PDF form in iBooks on my iPad) or, with many more illustrations, as a softcover. 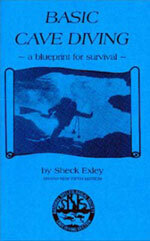 Highly recommended for anyone interested in the intense world of extreme diving.